I hate (big bold hate here) paying full price for race registrations. And when you participate in a lot of runs and triathlons like I do, especially those half- and full-Ironmans, your wallet takes a huge hit. I'm still in the process of finishing my 2013 taxes, and itemizing everything that can't be written off, but I don't want to even think about how much money I spent on races in the last year. Or how much I could have saved if I didn't wait until the last-minute to sign-up for some races because I didn't know if my body would hold up to be able to cross the finish line. Surely, I'm not alone here. Who doesn't wait until the weather gets warmer or the first race of the season has been completed before plotting out the rest of your running and racing season? OK, so I have a friend who might sign up for everything and then bail on all those races that sounded pretty exciting in January but lost their luster come June and July. For the rest of us, we weren't ready to pull the trigger in the middle of winter, but we're ready to add some races to the calendar now before we're paying full price (or watching the race fill). Tomorrow might be April Fool's Day, but it's no joke that some race registrations will rise with the start of a new month. No fooling here: The clock's counting down to save on these six Chicago races. Why run it: There really isn't a better way to kick off your Memorial Day Weekend. 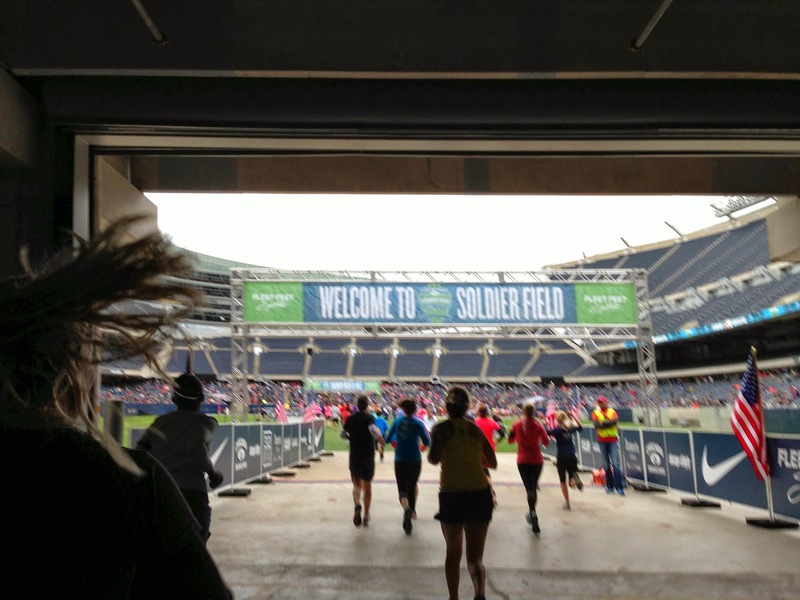 Your run will be in the books before noon, you get to finish on the 50-yard line at Soldier Field, and the opening ceremony is so moving you'll remember why we have the three-day weekend in the first place. Why run it: You're feeling the runner's high from yesterday's Shamrock Shuffle, but you want to double the distance. Plus this is one of those races that every Chicago runner has to run at least once--it was my spring running ritual until that weekend became the one where I was readying to run the Boston Marathon or I was closing out the ski season. Fee increase: The registration fee is $40, but Universal Sole has a coupon code expiring at midnight that'll save you $8. Enter SHAM8 at checkout. Why run it: When was the last time--or the first time--you ran a four-mile race? Probably never, or not often enough, which means automatic PR. Fee increase: Registration is currently $90, but it increases $10 in April and goes up from there. Why run it: You'll get a great tour of the city without having to log the 26.2 miles of the Bank of America Chicago Marathon. And if you are deep in marathon training, this race couldn't come at a better time--you can use it toward training, or nabbing a time worthy of placing you into a seeded start corral. Plus last year we spotted two Biggest Loser contestants on the course. Fee increase: From now until May 31, registration costs $40. But the same code that works for the 4-Mile Classic applies here. Enter SHAM8 to save $8 at checkout. Why run it: For starters, this race just keeps getting bigger and better with more runners, more beer on tap and more burgers to nosh on after the race. Plus it's just one of the many races you can run during the city's busiest race weeks of the year (for starters, run Bastille Day July 10, Chinatown 5K July 12, Strike Out ALS July 15). Fee increase: Race registration is currently $80 but it'll increase to $90 on April 1--and keeps going up from there the more you drag your feet. Why run it: History is in the making at this women's half marathon and 5K that's turning three in 2014. No race has ever been run on Chicago's Magnificent Mile--until Labor Day Weekend when this race's course includes it. Admittedly, I'm a little clueless when it comes to race specifics outside the Windy City. I might run them, but I'm usually the one who has no concept of when the prices rise, or when I can register for the best price. So tell us: When is the best time to register for your favorite races? When do the prices increases for races in your city? How do you save on race fees?